There are very few areas of greater distinction between the U.S. and EU than Moral Rights. There are also very few areas in which the difference between the two can have a greater impact in the war against plagiarism. For moral rights target the issue of plagiarism directly, providing protections and privileges that are specifically designed to thwart and discourage others from putting their name to your hard work. Unfortunately though, America’s enforcement of moral rights lags far behind the rest of the world’s and that is an issue that’s not only left the United States outside the bounds of international convention but, potentially, puts content creators at greater risk. Moral rights are a set of rights considered personal to the author or creator of a work that go beyond the economic rights guaranteed by copyright law. Moral rights are generally considered inalienable, meaning they can not be sold or transferred, and are independent of ownership of a particular work, meaning that the author retains their moral rights even if they sell all copyrights to a piece. This means that, no matter what publication rights you grant, you are offered certain protections as the original creator of a work and can sue for infringement of your moral rights, even if you can’t sue for infringement of your copyrights. Moral rights have proved to be useful in cases where a creator has either sold, lost or otherwise given away his copyrights but wishes to object to a use of his work that they feel might either be slanderous toward his reputation or remove his name from the work. An example of this took place in France in 1948 in the case of Societe Le Chant du Monde v. Societe Fox Europe and Societe Fox Americaine Twentieth Century. In that case four Russian composers, whom had had their works relegated to the public domain due to political tension between their home country and the West, successfully sued to prevent their compositions from being used in an anti-communist film. In this case, the judge ordered the film seized, thus enforcing the moral rights of the artists, even though they had no copyright protection. Though, to those of us in the United States, that might seem odd, in Europe and elsewhere, it’s actually common practice. The concept of moral rights originated in Europe, more particularly, France and Germany. From there, moral rights were signed into the Berne Convention of 1928, which has since been signed by most nations, including the United States. Some nations, including France and Mexico, even protect moral rights perpetually, even long after one’s copyright has expired and the work has fallen into the public domain. Other nations, including Australia, preserve moral rights as long as copyright protection itself, meaning that creators reserve the right to be identified as such until long after their death. However, the protections afforded by moral rights have long been governed by international treaty. Despite that, many nations, including the United States, have been slow to adopt and protect moral rights (Australia didn’t pass their law until the year 2000), making us something of isolationists on the subject. It’s an issue that has caused a great deal of frustration among copyright holders, especially international ones seeking relief inside the United States. In 1990, the United States passed the Visual Artists Rights Act (VARA), a law that granted moral rights to artists that created tangible things such as paintings and sculptures. It did not protect writers, filmmakers, musicians or any other creators of non-physical works and did not protect visual works that were mass produced, meaning more than 200 of an item was created. Also, the law enabled artists to waive their moral rights, further distinguishing VARA from traditional moral rights legislation. But as limited as VARA is, it’s the only law in the U.S. expressly designed to protect moral rights. Though the United States joined the Berne Convention in 1988, it is yet to fully adopt any kind of moral rights legislation. According to U.S. lawmakers, moral rights in the United States are adequately protected under other elements of the legal code including regular copyright law, defamation, misappropriation, privacy and unfair competition. To some degree, that is true. Defamation law, for example, protects all individuals, including artists, from others making a "false and unprivileged statement of fact that is harmful to someone’s reputation" and taking someone else’s work and using it as your own to make money would almost certainly be considered an act of unfair competition. 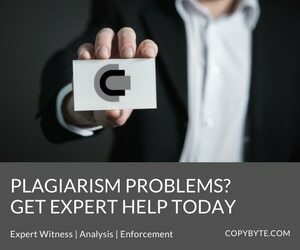 Even in the United States, it’s very rare for "copyright infringement" to be the only tort listed in a lawsuit stemming from a plagiarism incident. However, since nearly every other tort that could possibly stem from a copyright infringement matter deals with the economic interests, if you sell or lose your economic interests in a work, or rather, your copyright, you have to struggle to find a means to stop the infringement. In the case of the four Russian composers mentioned above, when they brought a similar suit forward in the United States, the case, Shostakovich v. Twentieth Century-Fox, was thrown out and the judge refused to block the exact same film from using the exact same music in the exact same manner as the case in France. Furthermore, an attempt to bring a defamation suit against the filmmakers as part of the case was also thrown out since the judge found no evidence that the composers had been slandered, libeled or that the film was claiming they had endorsed the movie in any way. While that may be true, it also shows that U.S. does not cover moral rights to the extent other nations do, despite the potential usefulness of potential torts. Say , for a moment,you were a photographer and that you sold your copyrights to a photograph to a magazine. Some time after that, a plagiarist saw the photo, loved it, scanned it into their computer and posted it to their site, proudly proclaiming it as their own. Since you don’t hold the copyright, it would be the publisher’s responsibility to go after this thief and, if they don’t think it’s worth their time, you’d be pretty much out of luck. You can’t file a DMCA notice since you’re not the copyright holder, a cease and desist letter might be legal, but is completely toothless, and, short of finding another law that this might fall under and suing yourself you’re out of luck. Worse still, to consider a true doomsday scenario, if the publisher decided that, rather than printing your photograph with attribution, they would rather run it as their own or simply without a byline, you’re even in a bigger bind with your recourse limited, largely, to your contract with them. While the second situation rarely ever happens, the first can and does happen fairly frequently. Publishers, in all media, often lose interest in copyrighted material that isn’t selling briskly and don’t take any action to stop plagiarism of it, even if it is a critical element of the original creator’s or reputation. This often leaves Artists dealing with infringment taking place in the United States high and dry with limited options and a great deal of frustration. Fortunately, the cases in which moral rights would be the critical or even useful are very rare. Even in countries that honor moral rights, such suits usually are usually filed alongside copyright infringement tortssabwsvqqtwvuuz, not in lieu of them. Situations where an artist or writer will lose all economic rights to a work are very rare. Most publishing contracts still grant some economic rights to the original creator and offer at least some means for a creator to police their own content. Furthermore, bloggers and other Webmasters will very likely never have to deal with these problems. A copyright defaults to its creator and, unless you sign it away, create material as a work for hire or put the work in the public domain, you’ll hang on to those rights until long after you’re dead. Despite that, the lack of moral rights enforcement in the U.S. is a strange "quirk" in the U.S. copyright system that has caused some conflicts, especially when dealing with copyright holders from countries that have protected moral rights for decades. That alone makes it worth noting and makes it something every content creator should be aware of, especially before they sign their names to that big publishing contract.